May’s Moon – a ‘Hare’ raising Tale. or the Full Planting Moon, a signal to begin tucking tiny seeds into their beds of soil. It is also the Full Milk Moon, in celebration of the happy cows that have been moved into the pasture to graze on lush green grass. I love each of these names for the May moon, just because I love spring. 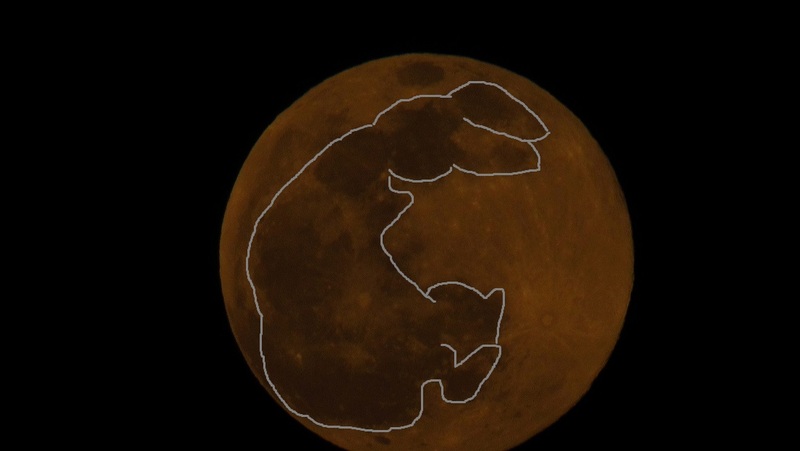 But my favorite name for this moon is its English Medieval name—the Full Hare Moon. The moon and hare have a long history together. The Egyptians believed the hare to be a messenger to the female moon goddess. And to the pagans, a moon-gazing hare is a sign of fertility, growth and new-beginnings. But these tales of the moon and the hare are not what draws me to this Full Hare Moon of May. The hare raises her nose and sniffs the warming night time air. Her long ears swivel as she listens to the sounds of night—the sleepy chirps of birds as they settle into their nests, the song of a cricket from the nearby woods, and someplace in the distance a wolf howls. Feeling exposed under the bright light of the full moon she hops cautiously into the field. 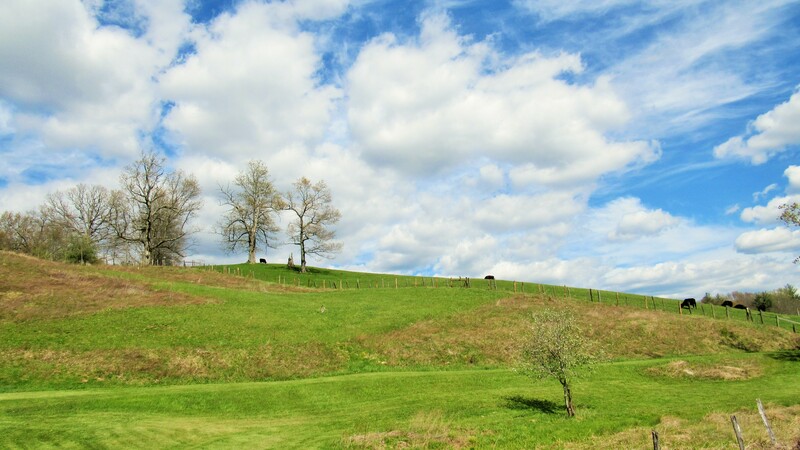 Spring has taken a solid hold on her meadow and the tender green grass is so sweet that she soon forgets her caution. Only a few hours ago, she’d raced through this same meadow as she’d tested her mate’s speed. It was in this very spot that she’d slowed, then rose onto her hind legs and boxed him in the face. She was pleased that he did not turn away, instead he resumed the chase as she dashed away from him once more. She felt satisfied that she’d chosen a good mate. A shadow moved over her. With a squeal, she pushed off with her strong hind legs. She felt the owl’s talons brush her tail as she raced across the meadow. She darted left, then right. She could see the trees now. How had she wandered so far away from them? The shadow glided across the field—closer, closer… The whoosh of wings filled her ears and she felt the rush of air against her fur. But the sharp talons closed on empty air. With one final leap, she reached the woods and ducked into the shelter of a large rhododendron. She flattened her ears as the owl’s screech filled the night air. Safe in her shelter, the hare looked up through the leaves at the moon. She thanked the bright moon for its shadowy warning that had changed her fate. As I gaze up at the moon tonight, I will look for the hare on the moon. The Egyptians, Chinese, and Native Americans all have legends as to how that hare came to live on the moon. But for me, that hare is a reminder to pay attention to the world around me and to enjoy this life. 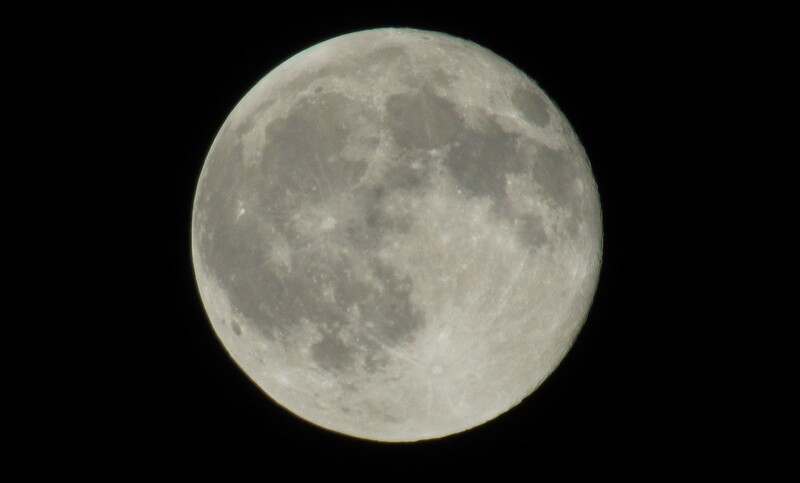 This is a shot I took of last night’s moon. 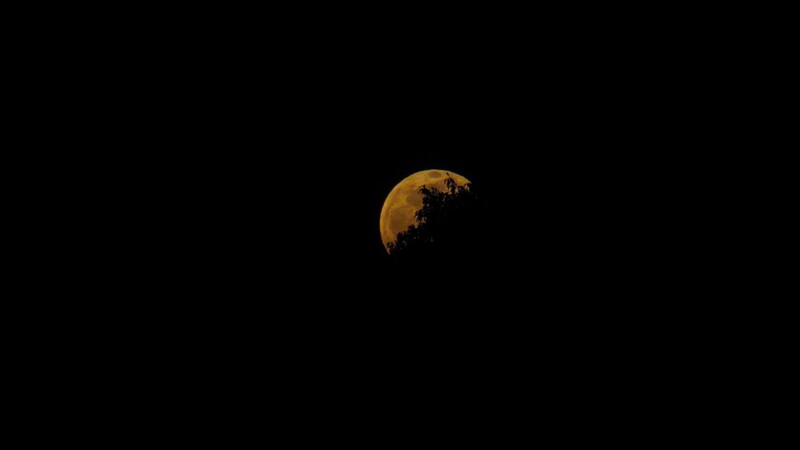 The moon was still low in the sky and the reflections o f light in the atmosphere gave it this beautiful orange glow. 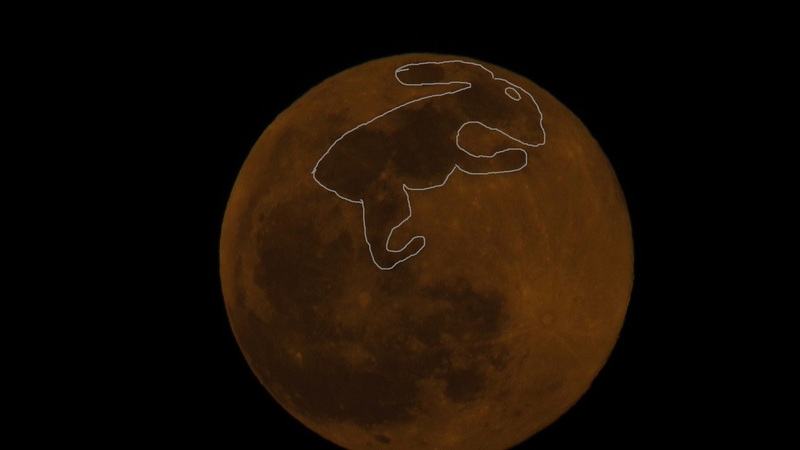 Try to ignore my substandard drawing skills, but I traced out the two images of the hare on the moon for you. Ha ha! I laughed out loud when I read that the hare knew she had a good mate when she boxed him in the face. I don’t recommend it for people, however. Thanks for another legend about the moon, Teri. Nothing but the hare facts!! Thank you for sharing this interesting and delightful Egyptian legend. Enjoyed!